One of the first things people notice about you is your smile. Bright teeth can make us appear younger while dull, yellow teeth can make us look older. Fortunately, there are easy, proven solutions for stained teeth. One of the most popular treatments is in-office teeth whitening. In-office professional teeth whitening is an easy and comfortable procedure that can dramatically whiten teeth in less than an hour (all while enjoying the beautiful view watching planes take off at LAX Airport). Whether you desire a quick in-office treatment or the simplicity of at-home teeth whitening, South Bay Smiles can help you restore your naturally bright and youthful smile. With our in-office teeth whitening, all it takes is one visit to whiten your teeth up to nine shades. We use several teeth-whitening methods, including BriteSmile, the revolutionary laser teeth-whitening system that’s clinically proven to be safe and effective. With proper maintenance and oral hygiene, one BriteSmile Tooth Whitening treatment can last for years. BriteSmile works more effectively than whitening toothpastes or dental whitening strips, as its laser teeth-whitening system penetrates deeper than the surface stains. Depending on what type of whitening treatment is best suited to your individual needs, we also offer a Dash whitening treatment. Dash is similar to the BriteSmile procedure, but does not use a light and is a bit less invasive. Call our Los Angeles BriteSmile experts today to schedule an appointment and figure out which whitening treatment is right for you! Before your in-office whitening treatment, we will examine the current color of your teeth and then discuss your goals for your whitening treatment. We will give you a realistic idea of how white your teeth will be after your treatment. The more stained your teeth are, the harder it is to get them to be bright white. However, we will do everything we can to improve the color of your teeth to reach your smile goals. Before the treatment, we will apply a 17% hydrogen peroxide gel to your teeth. The gel is then activated by an LED light that is placed in front of the teeth. The light and the gel work together to penetrate the dentin, where the tooth stains lie. The entire procedure will take a little over an hour from start to finish. During the procedure, you are able to listen to music on your iPod or watch TV. The longevity of your teeth-whitening results really depends on your lifestyle. Although the effects are not permanent, they can last for over a year. If you consume a lot of coffee, tea, or wine, or smoke cigarettes, then your results will not last as long. However, if you use the BriteSmile at-home whitening trays, or come to the office for touch-ups, you will be able to maintain your results for much longer. The natural aging process—not to mention smoking and drinking coffee, tea, and wine—contributes to a dull, yellow smile. But you don’t have to settle for that. Contact us for an appointment today and we'll determine the best way to whiten your teeth, so you can look and feel better about your smile. Your Marina del Rey Britesmile expert, Dr. Bradley Matthew, DDS, MICOI, can help you achieve the best teeth whitening possible and advise you on the best options for your particular smile. 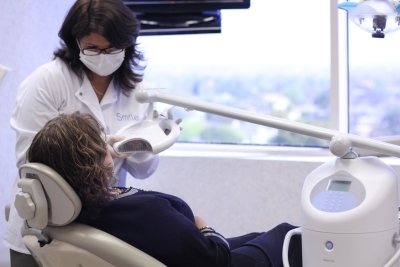 At South Bay Smiles, we treat patients throughout Santa Monica, Los Angeles, Marina Del Rey, Manhattan Beach, Redondo Beach, Culver City, Venice, Hermosa Beach, and the surrounding areas in Southern California. We want to help you achieve the white smile you've been hoping for. Dr. Matthew, DDS, MICOI, discusses best teeth whitening options, including in-office procedures like BriteSmile. There are many things that can cause your teeth to stain. As we age, our teeth become less bright. Additionally, smoking, certain medications, and drinking wine, coffee, tea, and soda can all contribute to a dull smile. The best way to achieve white, shiny teeth is to undergo professional teeth whitening. Schedule an appointment with South Bay and Inglewood BriteSmile expert Dr. Matthew, DDS, MICOI, who will be able to determine the best course of action to get you the results you are looking for. Does teeth whitening damage the tooth enamel? No, the methods of teeth whitening we use do not damage or corrode the tooth enamel. Will the teeth whitening session be uncomfortable? The staff at South Bay Smiles will place shields over the gums and lips to reduce any possible contact with the gel. Those with sensitive teeth may experience tooth sensitivity after the procedure. Why can't I eat or drink any colored foods after a teeth whitening treatment? During the teeth whitening treatment, the dentin is opened to allow the peroxide mixture to penetrate your teeth and eliminate stains. As the gel penetrates the tooth to remove stains, your teeth are then more prone to staining. It will take about 24 hours for the dentin to reseal itself. Eating white or clear foods will ensure that your teeth remain white and bright after your teeth whitening treatment. What is the difference between BriteSmile and Zoom! Whitening? The gel mixtures and lights used during the treatments differ. However, the results from the two treatments are virtually identical. In fact, BriteSmile and Zoom! are owned by the same company. The marketing of the two companies is different. Zoom! has been marketed heavier in the past few years and has spread to more parts of the country. The difference in popularity is largely due to the fact that Zoom! is in more convenient locations. My teeth were discolored from taking antibiotics. Can in-office teeth whitening fix this? It depends on the amount of discoloration. In some cases, in-office tooth whitening can decrease the discoloration. In other cases, it is not as effective. If this is the case, then dental bonding might be a better option for you. Interested in West LA Teeth Whitening? Contact a South Bay cosmetic dentist at South Bay Smiles today!